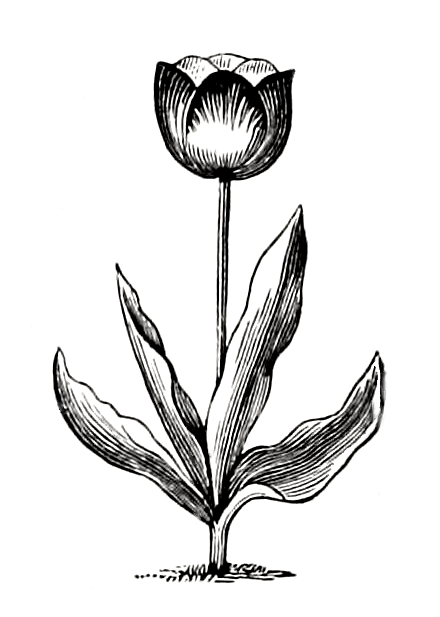 This tulip engraving is one of a pair of black and white tulip drawings from an 1893 nursery catalog. They adorned a page where the River Raisin Valley Nursery listed their instructions for ordering. The nursery primarily sold fruit trees and berry vines. This drawing features a single tulip plant with four leaves and a six-petaled flower. The tulip is fully in bloom and the drawing shows the entire plant. Just imagine how pretty you could make this one by adding some color. Here’s a link to the matching tulip drawing, maybe it will suit your project a little better or you can use them together as the designer of the catalog did.